Sewing upholstery fabric when covering furniture might seem challenging due to the thickness of the fabric, but it is actually very similar to sewing the lighter fabric used to make clothes. The difference between sewing light fabric and upholstery fabric is the powerful equipment needed to sew upholstery fabric. Also, sharp, sturdy scissors are needed to cut heavy upholstery fabric. 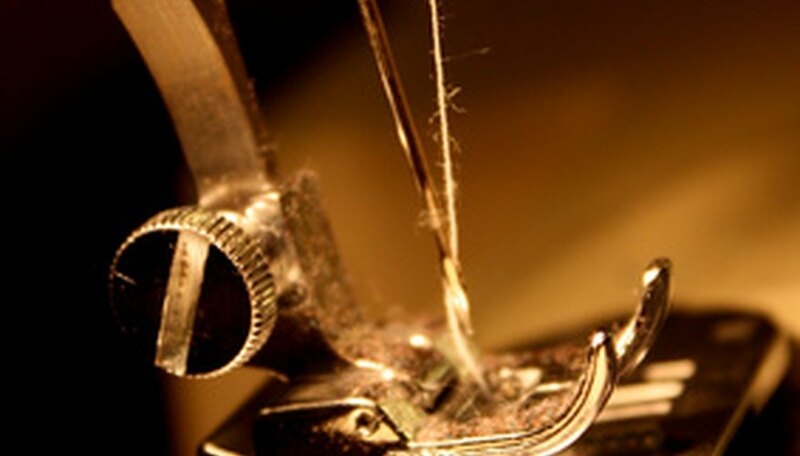 An industrial–or at least heavy-duty–sewing machine is also needed, because a household machine will not stand up to the heavy fabric for extended use. Inspect the raw edges of the upholstery fabric, looking for frayed spots and jagged edges. If you find any uneven or frayed spots, trim the edge, using the scissors, just enough to get rid of the damaged area. Set the sewing machine on a medium length stitch, and adjust the tension on the presser foot between a medium and light tension. Place the upholstery fabric with the right sides are together, and the raw edges aligned directly on top of one another. Position the fabric under the presser foot with a 1/2-inch seam allowance. If you are working on a loosely woven fabric that is prone to unraveling, finish the raw edges of the seam with a serger or using a zigzag stitch. If the fabric has a layer of backing attached, an extra seam finish will not be needed because the backing will prevent unraveling. What Type of Sewing Machine Do You Need for Auto Upholstery?